It appears that the master had an aversion to being photographed. Over his protest, a group picture was once taken of him and a cluster of devotees. It was an amazed photographer who discovered that the plate which had clear images of all the disciples, revealed nothing more than a blank space in the center where he had reasonably expected to find the outlines of Lahiri Mahasaya. The phenomenon was widely discussed. A certain student and expert photographer, Ganga Dhar Babu, boasted that the fugitive figure would not escape him. The next morning, as the guru sat in lotus posture on a wooden bench with a screen behind him, Ganga Dhar Babu arrived with his equipment. Taking every precaution for success, he greedily exposed twelve plates. On each one he soon found the imprint of the wooden bench and screen, but once again the master’s form was missing. Again the photographer focused his camera. This time the sacred figure, not cloaked with mysterious imperceptibility, was sharp on the plate. The master never posed for another picture; at least, I have seen none. 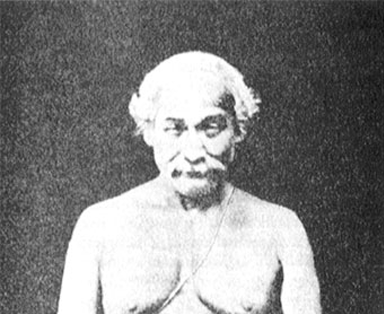 Lahiri Mahasaya’s fair features, of a universal cast, hardly suggest to what race he belonged. His intense joy of God-communion is slightly revealed in a somewhat enigmatic smile. His eyes, half open to denote a nominal direction on the outer world, are half closed also. Completely oblivious to the poor lures of the earth, he was fully awake at all times to the spiritual problems of seekers who approached for his bounty.